Anthem isn't hard sci-fi, Bioware says. It's more "science fantasy," like Star Wars. Ever since Bioware announced Anthem at E3 this year, people have been talking about it. It's been compared to Destiny, called a sci-fi game, an MMO, and more. But Bioware wants gamers to know that Anthem won't be hard sci-fi like Mass Effect. Instead, it's calling the game "science fantasy," and likening it to Star Wars. 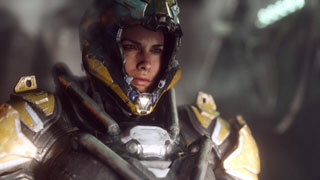 The clarification comes in an interview with CBC program Edmonton AM, in which Bioware general manager Aaryn Flynn describes Anthem as "a genre we call science fantasy very much like Star Wars, very much like the Marvel universe." He says the fantasy part happens when "you see a lot of amazing things happening but we don't worry too much about why they're happening or how they're happening, the science of it." Flynn also briefly talked about the gameplay in Anthem, saying, "there are shooting mechanics in it, it's an action game, it's a role playing game. It's got a lot of those elements to it that let you become a character and participate in this." Anthem is slated for a Fall 2018 release. EA says that the game will be "maybe a ten-year journey for us."